As housebuilders increasingly look to include ‘smart’ homes in their developments, as well as heating technology such as HIUs, Gary Perry explains why seamless integration is vital to optimise energy efficiencies. One fundamental element in a household that has already seen a high level of automation is the central heating system – witness the popularity of systems such as Nest and Hive. However, this level of automation could be taken to yet another level in terms of remote monitoring and command/control if the Modbus communication protocol suite developed by Modicon was connected to heat interface units (HIUs) installed in the property. 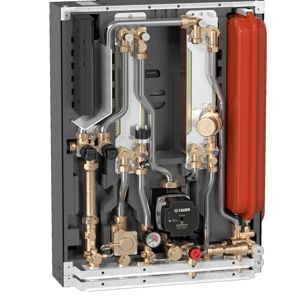 Before going into detail on the Modbus connection and what it delivers, it is worth focusing on the main benefits that HIUs bring to the end-user and why property developers and heating engineers alike should be specifying and installing them in every modern building. The first issue that HIUs tackle is the limited primary flow rate that many residents are affected by, particularly when living in a building containing several dwellings. Although the average apartment, for example, has a heating demand of around 3kW to 4kW that it takes from the network, it is widely known that for the first quarter of an hour when the heating switches on, this level of demand from the network can go up to 9kW. Of course, at peak times when the heating is coming on in many dwellings at the same time, the network capacity gets stretched and some tenants can even find themselves without any hot water. When an HIU is fitted that sets the maximum flow rate from the network, a 3kW apartment cannot take any more than its designated 3kW and so not only do all tenants get the hot water they need but the network is also protected from failure. Another issue that HIUs address is the return temperature in a heating circuit. Again, with an average apartment there is usually a low flow rate for heating, which often means the system cannot be balanced properly, and this in turn means the return temperature is much too high. The consequence is reduced network efficiency, which clearly needs to be avoided. An HIU equipped with a return temperature limitation setting makes it possible to set the maximum return temperature on the network. The benefit of this is that by automatically controlling its output the HIU will always make sure that the primary return temperature is never exceeded, again minimising the likelihood of network failure and boosting overall efficiency. A third area where HIUs come into their own in the modern home is preheat control, but it is important not to be restricted by having a permanent preheat function built in. Having such a setting wastes money by continually pulsing energy through the HIU, which is not necessary since residents don’t usually need access to water throughout the entire day. The solution to this issue is to install an HIU that is supplied with a preheat function and a configurable controller so that the resident can decide when the heating comes on and goes off. Remote controllability, choice and personalisation are vital to end-users in the 21st century and installing a HIU with full Modbus output/input offers the possibility of delivering on all fronts for tenants. By using Modbus, the set-up and commissioning of single-, or multiple-HIUs, can be done remotely, as can any checking for faults or reading of error messages. Should there be a problem with the HIU, it is possible to remotely analyse it and decide on appropriate action before a maintenance engineer is sent. This can save a considerable amount of time and frustration, not least because the engineer will be arriving on-site with the correct equipment, tools and parts to deal with the issue. One of the main remote communications protocols that is designed for use with building management systems is the open Modbus RTU (remote terminal unit). Called an ‘application layer messaging protocol’, Modbus RTU works by using networks )or buses) to provide communications between connected devices. Because it is an ‘open’ protocol and not based on proprietary content, it can be implemented into systems without incurring any royalty costs, which has helped to increase its availability and turn it into a recognised standard communications protocol. Modbus RTU is particularly suited to use within a system that deals with temperature control and communicating the results via some form of electronic device. Of course, having a certain level of simplicity comes hand-in-hand with having a number of limitations in terms of functionality but Modbus RTU is still a winner because it is easy to set up and operate. At the same time, its straightforward operation means that it requires much less memory than other protocols. Indeed, the serial level protocol Modbus RTU only needs 2Kb of memory, compared to others that demand up to 100Kb and have to run on an Ethernet physical layer. As the world moves towards having ‘smart cities’ and embraces the fourth industrial revolution that is the Internet of Things (IoT), the ‘intelligent building’ will become commonplace. The ability to remotely pinpoint a problem on a heat network to a single component will be as straightforward as it is today for an office worker to communicate with their set-top box and instruct it to record a programme they won’t be home in time to see. There has even been talk of a monitor worn on a jogger’s wrist checking the runner’s temperature and communicating with the heating/air conditioning system at their dwelling to ensure the ambient temperature is optimal in terms of comfort when they get home. At the same time, ‘winding down’ music could be playing automatically on their audio system. 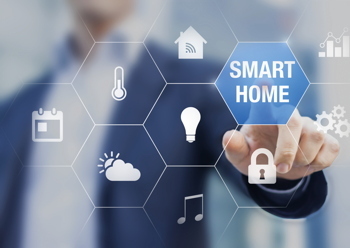 Despite the complexity that is involved in connecting devices in a ‘thinking’ building and managing them remotely, simplicity and affordability will always be essential as far as the installer and the end-user are concerned. Having a Modbus output on a HIU goes a long way to keeping things simple – and keeping costs down – in any ‘smart’ heating system, not least by eliminating the need to have a large amount of hardware installed. By enabling more accurate network control based on demand, the combination of a heating interface unit and the Modbus communication protocol suite will mean heating networks will become far more efficient, more environmentally-friendly and ever-more in tune with the needs of users. In turn, any property developer offering the capability and benefits of remotely controlling a heating network will have a competitive edge over other developers on the market.